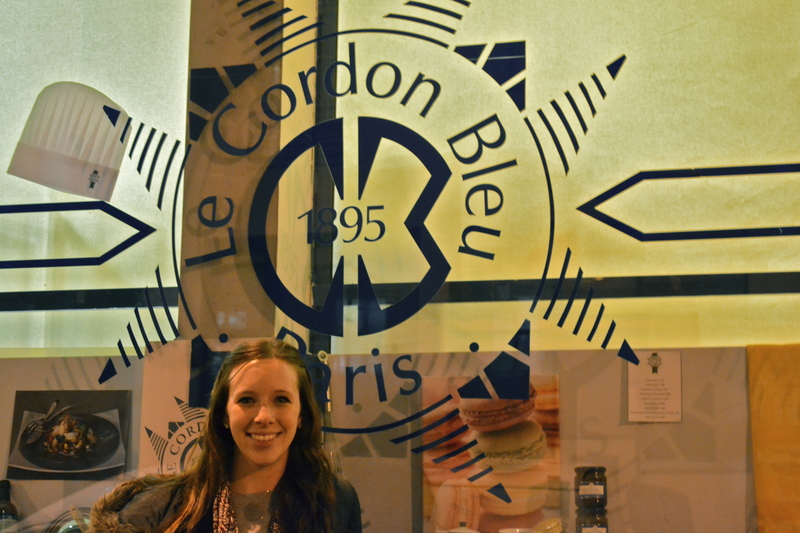 Tonight I fulfilled a lifelong dream of mine – to take a cooking class at Le Cordon Bleu de Paris. 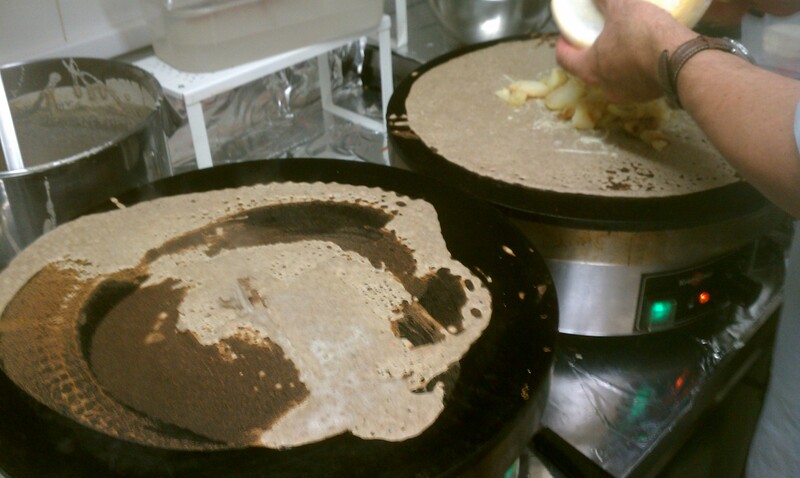 On Tuesday night I was feeling a little defeated after having attempted, and failed miserably, to make a crepe on the professional machine they use while at a group outing for IES. 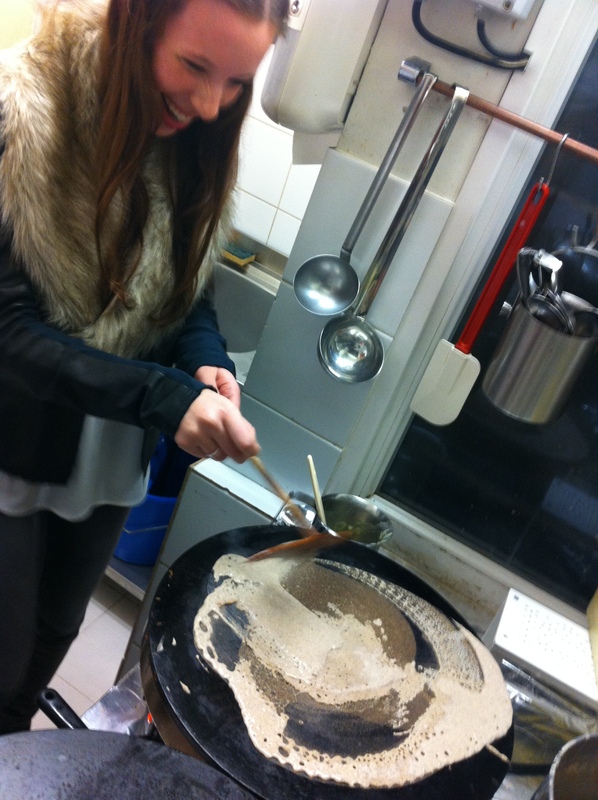 Needless to say I will not be going into the crepe-making industry. When I was growing up, watching the food channel didn’t really count as “TV time” so you can guess what I watched most of the time. One of our favorite family sayings makes fun of Jacques Pepin’s slogan “Happy cooking” (ap-ee coo-keeng), but with his funny French accent we always made it sound like “Happy pooping!” Real mature, over there in the Sommer household. Anyways, with my family’s love of cooking, I too, found myself watching Julia Child and Jacques tear it up together in the kitchen and I introduced my family to our number one fave Italian hottie Giada de Laurentiis which I watched every day after school. I get really sad thinking a lot of my peers don’t know how to cook, because for me, it just seems pretty simple. In fact, I feel like cooking is a lot easier than baking in a lot of ways. It just takes having an understanding for the basics. What you don’t need a lot of the time, is an actual recipe. It’s a creative adventure all the time, and as my French chef said, requires not only your nose and mouth to sense the food, but your ears as well. One of my all time favorite Disney Pixar movies was Ratatouille, not only because it was based in Paris, but also because the entire movie revolved around food. Jacques Gusteau’s phrase “Anyone can cook” really rings true for me – I think that if you have the capacity to learn (and taste), you CAN cook. I don’t think I can cook as well as say, my dad, but I know what tastes good, and I’m always willing to try something new. Tonight’s class was actually a food demonstration, since a lot of the cooking classes for these few months were either all-day courses or 200 euro (and/or full already), so I took what I could get and signed myself up for the “Chef’s Secrets.” The class was taught in French but with an English translator. That was weird. There are still a lot of names of foods I don’t know, but when I see them I can easily figure out what they were, so for me, having the French translator was pointless and bizarre to hear the same thing being said twice. 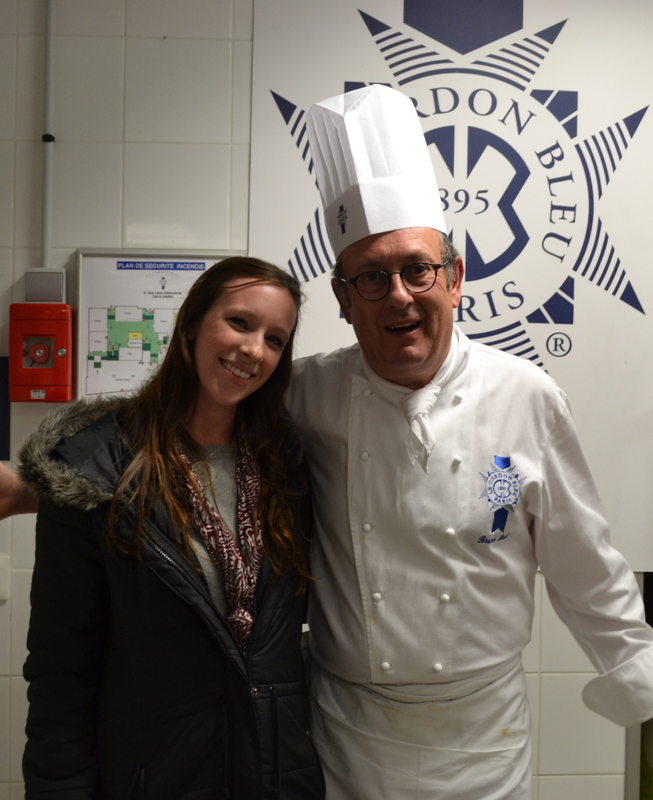 My friend and I also noticed that her French accent was sub-par when she was translating questions back to the Chef for him to answer. I could probably do that job… with free meals as a bonus! 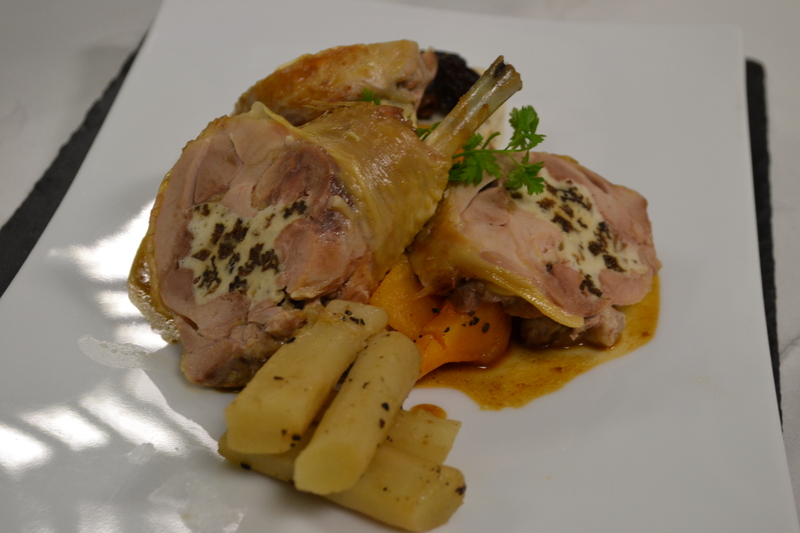 What the chef demonstrated for us was a chicken leg stuffed with a white-meat chicken filet pureed with cream and egg whites and mixed with chanterelle mushrooms, cooked over a bed of fresh vegetables, and with a reduction of the juices as a sauce. On the side we had a simple risotto made with marscapone and more mushrooms. It was divine. This is one time where I can say that I have learned a lot from TV. Parents – listen up! It’s true. My years of watching the Food Network have taught me a lot. Jacques and Julia, two of the greatest TV food personalities, along with Giada, taught me a lot about being myself while cooking. I don’t think I’ll ever have the patience to go to cooking school, but for now, taking clases here and there is enough for me. 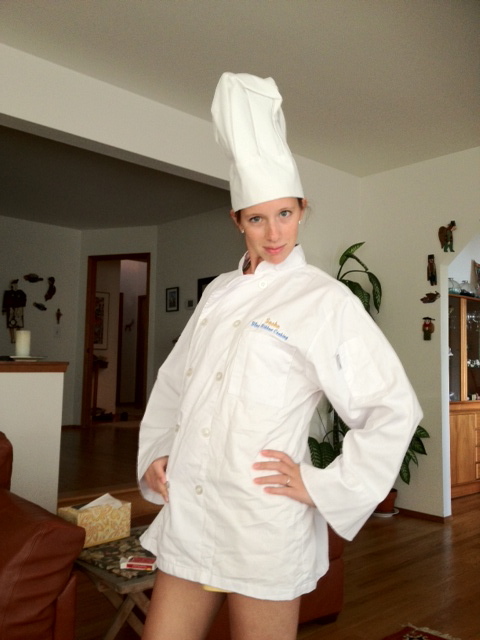 I did go to cooking camp once in 8th grade… I had a really cool outfit too. Well, that’s one thing I can cross off the bucket list. I hope to go back again soon, considering I live about a five minute walk from LCB I guess I have no excuse not to! In honor of all those food lovers, I wish you happy cooking, bon appetit, and best dishes from my kitchen to yours!